You’ve probably heard of the term “band of brothers” used to refer to those that have shared a camaraderie and kinship while serving together in the military. Residents Doctors Nisson, Timpson and Newton have created a band of dentists that are committed to paying homage to the veterans in our community while also initiating a special program called Freedom Fridays that provides unemployed vets in the greater Las Vegas area with free dental services. Warm Springs Dental was established in 1990 by Dr. Nisson. After the practice began to grow, Nisson convinced his dental school roommate Dr. Timpson to join him. Soon the small office was overwhelmed with patients seeking treatment, during which time Dr. Newton joined the practice. In just a few short months, it was clear that the team of three dentists and their staff needed a bigger office, so the practice was developed at Warm Springs and Stephanie across from Green Valley High School. 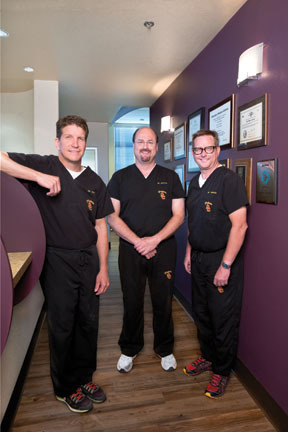 In 2002, the three dentists joined forces again to open a second (satellite) location called Anthem Village Dental, located in the Vons center of the Anthem community. Since the doctors have enjoyed the support of the Henderson and Las Vegas communities for the past twenty-two years, they decided to give back in a way that shows their appreciation for the men and women that fought for our freedom, particularly in these tough economic times. This band of dentists understands that tough times can be even harder for veterans who have fought for our country and been unable to find consistent employment to support themselves and/or their families after returning home. The doctors talk about the Freedom Fridays program that provides comprehensive dental care to vets and about their own lives and aspirations. Tell us about Freedom Fridays and why it’s such an important program. How do vets get into the program?